Use with liquid detailing product including strong degreasers! The SprayMaster Heavy Duty Bottle and Sprayer is a high quality, reusable and durable spray bottle! Nothing is worse than having a bottle and/or spray trigger fail which wastes time and valuable product. This spray bottle and trigger are made of a thicker resin and chemically resistant components, which extends durability and longevity of this bottle, meaning less spray bottle failures! Interior cleaners, wheel cleaners, degreasers, pre-wash treatments, instant detailers, etc. almost any one of your favorite detailing products can be added to this bottle with ease. Use it with ready to spray products, or as a way to dilute your favorite chemical. 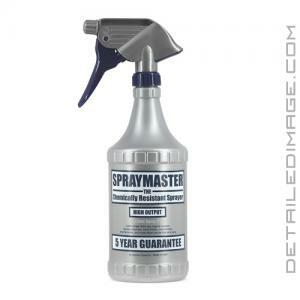 SprayMaster features a padded end cap so that the sprayer rests comfortably in your hand. This allows you to easily adjust the nozzle and spray product onto the surface with a 3.0cc per stroke spray output. This bottle is 32oz and measures 12" x 5" x 3.5". Stop wasting time with low-quality spray bottles that don't last, pick up the SprayMaster Heavy Duty Bottle and Sprayer instead! Need some extra triggers? Pick up the SprayMaster Sprayer Trigger, a perfect fit for this bottle! So far so good! Haven't used it much. I like the trigger and how it sprays. Seems to be built well with the thick plastic. Thanks, Detailed Image for the quick service.